Before we ask, “What perennials should we plant?” we may want to ask the larger question, “Why do we plant perennials?” In the past, herbaceous plants were used mainly to add color. In nature they serve many important functions, and garden designers can use them in many of the same ways. This approach can be particularly useful as we begin to look for alternatives to mowed lawn, and find ourselves planting far larger areas than have been traditionally allotted to the garden. Thinking of perennials as the “ground layer” of the landscape, as opposed to the “flower border” makes their functional role much easier to envision. What then are some of the functions of the perennial ground layer in nature, and how can these functions be incorporated into garden design? This includes erosion control, and the prevention of invasion by other plants (in garden parlance, weeds). Many landscape gardens are planted with trees and shrubs, leaving extensive areas of exposed mulch. When perennials are added to the mix, they are often arranged in isolated groupings, mainly to add color. Leaving exposed areas of mulch creates an open invitation to weeds. Taking advantage of the stabilizing potential of a competitive, dense herbaceous layer can significantly reduce the weeding necessary to maintain the landscape as well as eliminate the need for costly annual mulching. The herbaceous associations found in our native plant communities can serve as models for the successful design of these compositions. 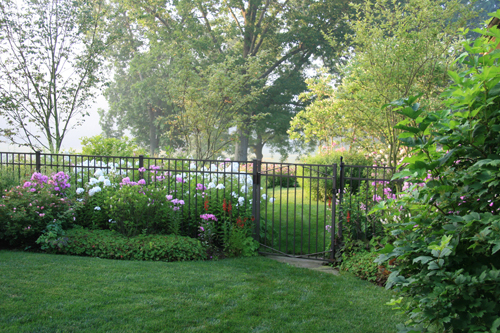 Observing these associations and adapting them to the garden can be extremely useful. Some plants grow naturally as a dense monoculture, and consequently can be competitive in the landscape when planted alone. Examples of this are Woodland Sunflower (Helianthus decapetalus); Hay Scented Fern (Dennstaedtia punctilobula), and Canada Anemone (Anemone canadensis). Some of these species, like Canada Anemone, are too aggressive for smaller gardens, but as the size of a planting increases so must the competitive ability of the plants that are being asked to colonize it. It becomes crucial for the designer to analyze the scale in which they are working and select plants that are capable, but not over-capable of doing the job. Other plants require associate species in order to form a cover dense enough to stabilize the soil and inhibit weed invasion. In nature these compositions often exhibit far denser spacing than are commonly found in gardens, yet they have a graceful and balanced appearance in addition to a strong competitive ability. This is due to the complementary growth habits, both above and below ground, that the association has developed over many years of co-existence. 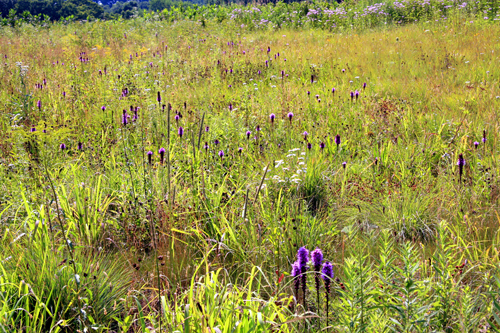 Our native meadow or prairie communities are an excellent example of this. Butterfly Weed (Asclepias tuberosa), Wild Cream Indigo (Baptisia leucophaea), and Little Bluestem (Schizachyrium scoparium) are a dry meadow association that can also form a very successful garden composition. Planting them in the dense and intermingled fashion found in the prairie only enhances their effectiveness, both functionally and visually. In nature, the herbaceous ground layer reduces the evaporation of existing moisture in the soil through its vegetative cover. In addition, the foliage and roots of herbaceous perennials increase the infiltration of rainwater into the soil, thereby maximizing recharge of the underground aquifers. This also reduces runoff, decreasing erosion and flooding as less water travels through the watershed. Wetlands have a particularly important role in this regard. Not only do they serve as massive water infiltrators, but also as pollution buffers as contaminants in the water are filtered out while passing through the leaves and roots of the herbaceous vegetation. As water issues are now front and center in our list of ecological concerns, it has become increasingly important to understand the interactions of water and the herbaceous ground layer in nature. Replacing runoff-prone lawn areas with meadows and other native herbaceous vegetation can increase infiltration and reduce runoff. 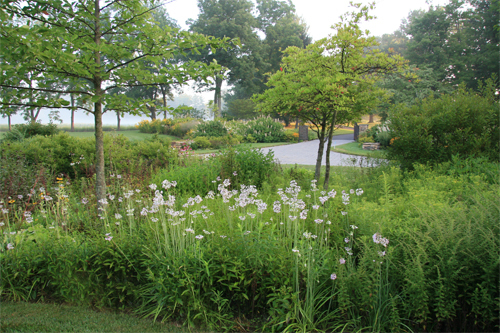 Rain gardens, or depressions planted with native wetland perennials, are designed to collect water and maximize infiltration, reproducing in the small scale some of the benefits of naturally occurring wetlands. Far from being an aesthetic liability, these plantings can contribute visual diversity to the landscape and afford the opportunity to incorporate some our most beautiful perennials, from the bold and architectural Angelica: Angelica purpurea to the diminutive but floriferous Meadow Beauty: Rhexia virginica. Herbs in the landscape are very important to numerous forms of wildlife. Many bird and mammal species require cover at various times of the year. Birds eat the seeds of many herbaceous perennials, and some butterfly species utilize perennials as host for their larvae, including Milkweed species (Asclepias incarnata, Asclepias syriacus, Asclepias purpurescens, etc. ), which are the sole host for Monarch Butterfly larvae. In addition to these rather obvious benefits to wildlife, a myriad of lesser-known interactions also occur. 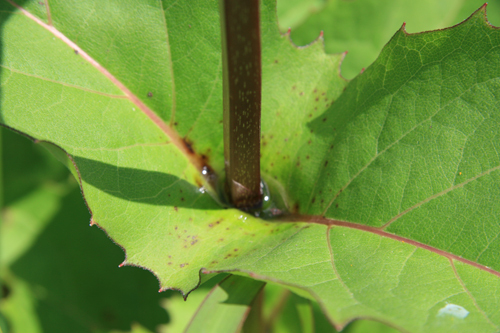 The leaves of Cup Plant (Silphium perfoliatum) collect water after rains, which is consumed by small insects. Birds in turn feed on these insects as they drink, a chain of events made possible by this perennial plant. Fig. 5. Rainwater collected in the leaves of Silphium perfoliatum. Hedgerows are often left over from agricultural landscapes, and consist of trees, shrubs and tough herbaceous edge species like Goldenrods (Solidago species), Bee Balm (Monarda fistulosa), and Mountain mint (Pycnanthemum virginiaum). They serve as crucial wildlife corridors between isolated natural areas, substantially increasing their ecological value. Owners of properties in residential developments can achieve similar results by planting consecutive native “hedgerow” gardens on their rear yard perimeters. Ground layer perennials are crucial as they provide a source of cover for the migrating fauna. This ground layer can also serve as a visual transition to more traditional plantings on the property by extending into the open yard, with a more gardenesque composition. An additional byproduct of this approach would be the visual integration of the individual properties in our neighborhoods, a characteristic that is sorely needed in many of our residential developments. Herbaceous plants play an important role in the successional processes of change that occur in virtually all plant communities. In many areas of the US, the herbaceous meadow is a temporary vegetative state that occurs after disturbance, and yields over time to the establishment of woodlands. 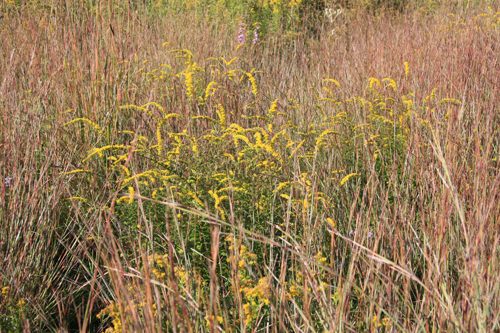 Even where prairies persist as a long-term plant community, a series of compositional changes occur, as annuals, biennials and short-lived perennials give way to the longer lived perennial plants of the mature prairie. In traditional landscape design, the only form of change is the increase in size of individual plants, but compositional change can also be incorporated. As in the prairie, fast establishing short lived plants (eg: Dotted Mint: Monarda punctata, Black Eyed Susan: Rudbeckia hirta) can be seeded or planted, to form a temporary cover, while longer lived perennials (eg: Culvers Root: Veronicastrum virginicum, Blazing Star: Liatris species) are getting established. Fig. 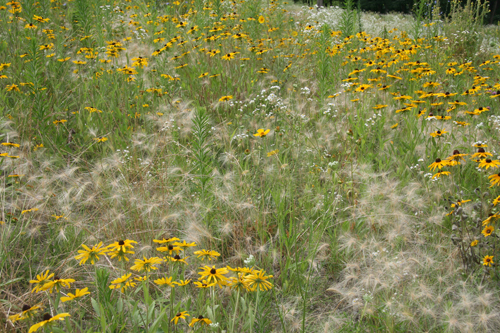 7 – Two year-old meadow with Rudbeckia hirta and other short-lived species. Fig. 8- Late-stage meadow with Veronicastrum virginicum and other later stage meadow species. In moist areas, wetland species can be combined to produce a similar relay process, with early colonizers like Cardinal flower: Lobelia cardinalis passing the baton to the late stage perennials like Pink Turtlehead: Chelone lyonni and Blue Flag Iris: Iris versicolor. In other instances, a meadow composition can foster the development of a woodland landscape. 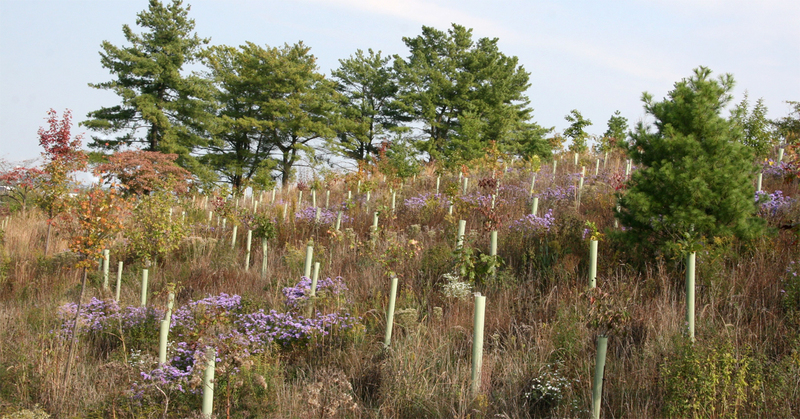 Newly planted trees take years to form a canopy capable of supporting woodland understory plants. A dense seeded meadow planting can be a cost-effective and aesthetically satisfying way to stabilize the site in the interim. 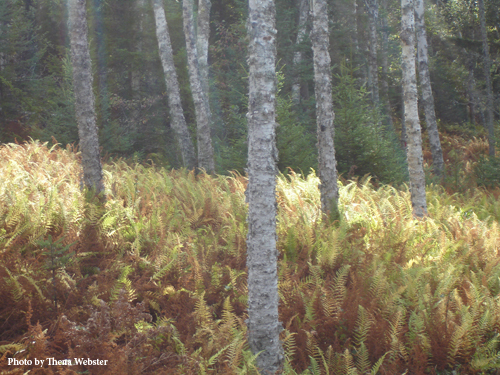 As shaded conditions occur, the meadow can be replaced with ferns and woodland wildflowers. Fig. 9 – Meadow as a placeholder until the woodland becomes established. 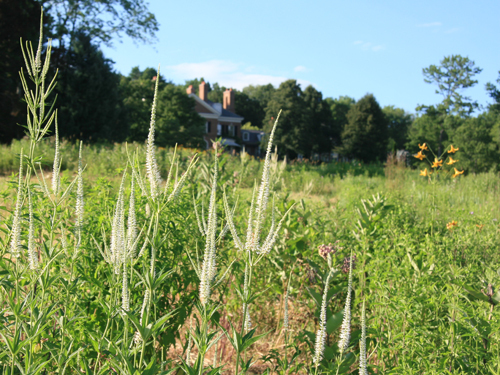 As all of the above examples illustrate, a great deal can be accomplished by planting perennials, less as individuals, than as interrelated parts of a plant community, occupying identifiable niches in both space and time. These communities can be literal or adapted translations according to the type of garden, but in either case, the plants have a functional job beyond looking pretty. If this all sounds like restoration ecology as much as garden design, that is precisely the point. Blending the sophisticated artistic techniques of the garden designer with the dynamic patterns revealed by the ecological sciences can only serve to enhance the manageability, ecology, and ultimately, the beauty of our landscapes. The perennial ground layer is as much the foundation of the house as the icing on the cake. Is there a reference manual that will identify eastern US native plants that show whether they are short-lived colonizers or longer term lived perennials. Dear John–Thanks for your message. Alas, we’re not aware of such a manual but wish there were! In the meantime, this is something you figure out through observation and by learning from others.